East Prussia in the German Empire. 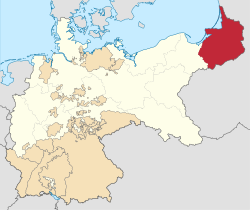 East Prussia (German: Ostpreußen; Polish: Prusy Wschodnie; Lithuanian: Rytų Prūsija; Latin: Borussia orientalis; Russian: Восточная Пруссия, Vostochnaya Prussiya) was a province in the Kingdom of Prussia from 1773 to 1829. From 1878 to 1918, it was part of the German Empire. From 1918 until 1945, it was a part of the Weimar Republic's Free State of Prussia. It's capital was Königsberg. After the defeat of Nazi Germany in World War II, the area was divided into to the Soviet Union (Russian SFSR, and Lithuanian SSR) and Poland (Warmian-Masurian Voivodeship). Königsberg was renamed Kaliningrad in 1946. The German population either evacuated or was expelled. ↑ "Sarmatian Review XV.1: Davies". Retrieved 8 December 2016. ↑ "East Prussia". Britannica. Retrieved 15 February 2019. This page was last changed on 16 February 2019, at 18:32.